Peterkin is a jester of international repute! with a genuinely authentic flavour for a wide variety of historical venues and events, bringing his unique style of historical comedy to events throughout Europe and all over the UK. A madcap fool, in the truest sense of the words, whether toppling precariously on stilts, fire eating or balancing upside down on anyone he can trick into lying on the floor. A Must Have for banquets, outdoor events, themed parties weddings or historical re-enactments. Peterkin can perform throughout an evening Banquet, as a walkabout entertainer or he can present his outdoor show involving acrobatics, comedy, fire and stilts: half an hour of serious silliness. As enjoyed by Elizabeths I and II. 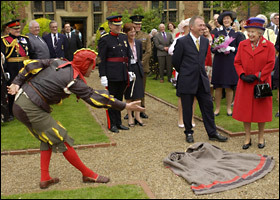 Peterkin has been Resident Fool at Hampton Court Palace since 1992. Other clients have included The Tower of London, English Heritage, Sir Cliff Richard and Virgin Trains. 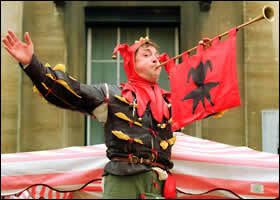 Peterkin was voted European Jester of the Year in 2002 and is Official Fool to the Lord Mayor of Bristol.